YOUNGSTOWN, Ohio — Student loan default rates at Youngstown State University have dropped nearly in half in the last six years, a trend university administrators say is the result of increased focus on student success, more scholarships and keeping costs low. “There are several initiatives we have put into place, and we’ve certainly made tremendous strides,” said Elaine Ruse, YSU director of financial aid and scholarships. 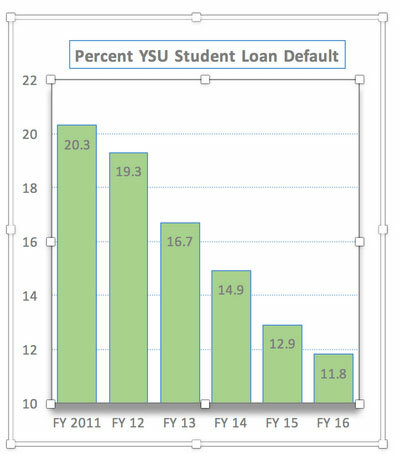 YSU’s student loan default rate stood at 20.3% in fiscal 2011, but has fallen every year since. Preliminary results for fiscal 2016, the year for which the latest data is available, set the rate at 11.8%, down nearly nine percentage points. that the university will continue to work to reduce the rate even more. One of the key reasons for the decline has been the university’s move towards a more selective admissions process, increasing standards for students to be admitted to YSU, Ruse said. Better prepared incoming students are more likely to succeed in the classroom, graduate on time and obtain employment, which in turn allows them to pay back their loans, she said.At the same time, YSU increased funding for its scholarship programs and reconfigured how such scholarships are distributed, Ruse said. That made more students eligible for scholarship awards, decreasing their costs to attend and, in turn, lowering the amount of any student loans they may need. Ruse said the university has also continued to work to keep student costs low through programs like the Penguin Tuition Promise, Penguin Jump Start, Affordable Tuition Advantage program and an expanded “bulk” tuition rate. In fact, College Consensus ranked YSU seventh in a recent list of the nation’s 100 most affordable colleges and universities, she noted. YSU’s annual tuition also remains the lowest among comprehensive public universities across Ohio, nearly $1,500 under the state average. On top of that, Ruse said the university has put into place several programs as early as the freshmen year to help educate and counsel students about loans, including information on borrowing responsibly, repayment programs, loan deferment and forbearance options.